Cerebral odema is an excess accumulation of water in the intracellular and/or extracellular spaces of the brain. 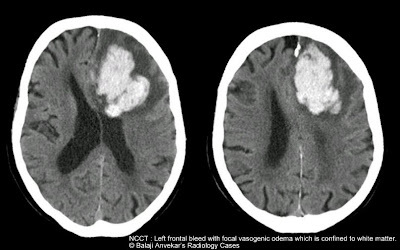 There are four types of cerebral edema, but the cytotoxic and vasogenic odema are the two of most clinical importance and it is equally important to differentiated between the two. 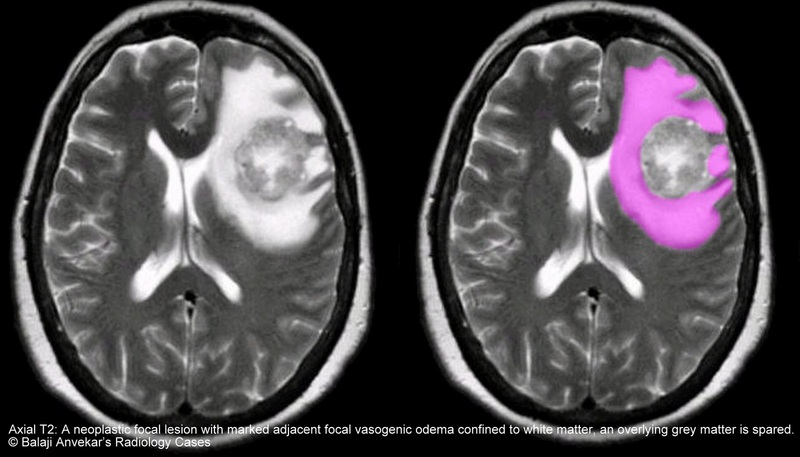 Vasogenic odema: occurs due to the failure of tight junctions and astrocyte processes which normally maintain an adequate blood-brain barrier. Result in normally excluded intravascular proteins and fluid to penetrate into cerebral parenchymal extracellular space. Once these plasma constituents cross the BBB, the edema spreads fast and widespread. As water enters white matter it moves extracellularly along fiber tracts. 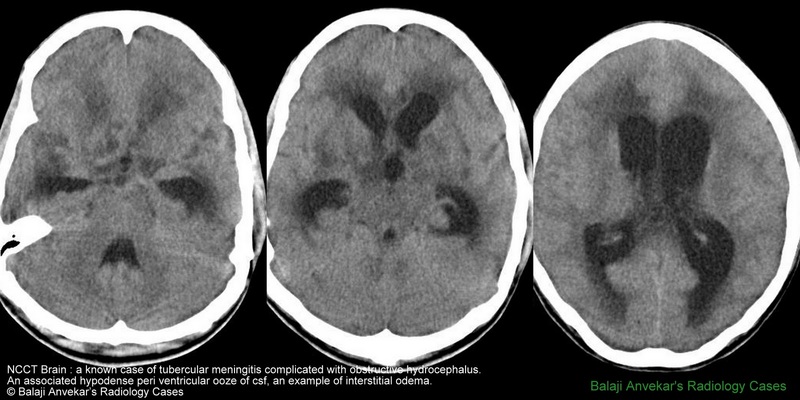 Imagingwise this odema is seen as hypodensity confined to white matter, involve sub cortical white matter , spares cortical grey matter, and pronounces the grey white matter interphase. 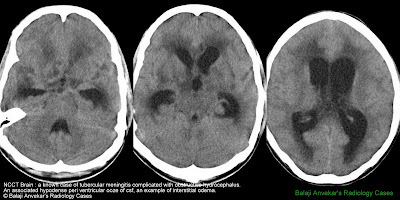 This type of edema is seen in response to hemorrhagic contusion in cases of trauma, bleed, venous infarcts, late stages of cerebral ischemia where an associated hemorrhagic transformation occurs, tumors, focal inflammation, acute hypertensive encephalopathy. Mechanisms contributing to BBB dysfunction are 1. physical disruption by arterial hypertension result from direct transmission of pressure to cerebral capillary with transudation of fluid into the ECF (extracellular fluid) from the capillaries 2. Trauma with bleed, 3. tumor-facilitated release of vasoactive and endothelial destructive compounds like arachidonic acid, excitatory neurotransmitters, eicosanoids, bradykinin, histamine, free radicals; vascular endothelial growth factors (VEGFs) which weakens the junctions of the blood-brain barrier. Dexamethasonecan, a steroid is of benefit in reducing VEGF secretion. Cytotoxic odema: In this type of edema the BBB remains intact. This edema is due to failure of ATP-dependent ion transport (sodium and calcium pumps). As a result there is cellular retention of sodium and water. Astrocytes get involved which occur in gray as well as white matter so Imaging wise cytotoxic odema seen as hypodensity involving cortical grey matter as well as white matter result in loss of normal grey white matter interphase. Cytotoxic edema is seen with various intoxications and early ischemia. Osmotic Odema: Normally CSF and brain’s extracellular fluid osmolality is slightly lower than that of plasma. When plasma is diluted by excessive water, the brain osmolality will exceed the serum osmolality creating an abnormal pressure gradient result in water to flow into the brain causing edema. Causes include excessive water intake or hyponatremia, syndrome of inappropriate antidiuretic hormone secretion (SIADH), hemodialysis, or rapid reduction of blood glucose in hyperosmolar hyperglycemic, hyperosmolar non-ketotic acidosis. 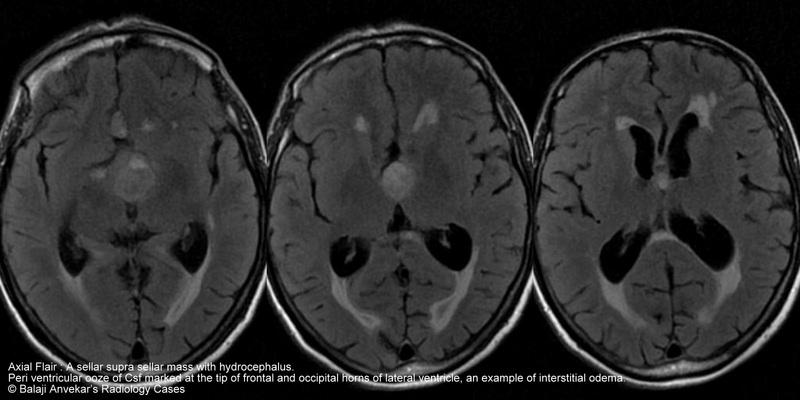 Interstitial Odema: Occurs in obstructive hydrocephalus, due to rupture of the CSF-brain barrier resulting in trans-ependymal flow of CSF, CSF penetrate the brain and spread to the extracellular spaces and the white matter. 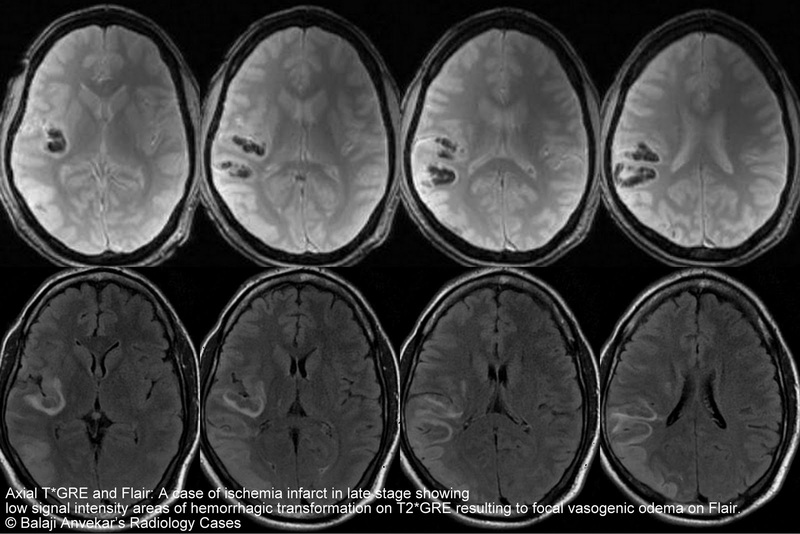 This is differentiated from vasogenic edema in that interstitial cerebral edema CSF contains almost no protein. 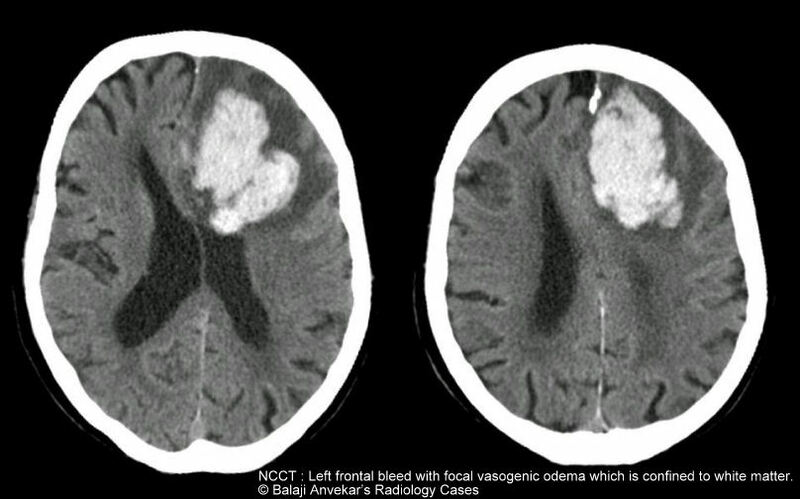 Cytoxic odema seen in ischemia infarct, seen as an abnormal area of uniform low attenuation or abnormal signal intensity, area of involvement corresponds to particular vascular territory, involves cortical grey as well white matter, loss of normal grey white matter interphase. Vasogenic oedema seen in around bleed, infective or inflammatory lesion like granuloma abscess, tumour, acute hypertensive encephalopathy. Seen as an abnormal area of low attenuation or abnormal signal intensity confined to white matter around the lesion, with finger like projections extending in sub cortical white matter. Spares overlying adjacent cortical grey matter. Grey white matter interphase is pronounced instead of loss. Concise and straightforward! I've searched on this topic for few days now, and the explanation/demonstration you gave is the best so far. THanks a lot! I enjoy reading your blog but I have a request.. Please please please change the background to white or light colour so that the text is more soothing to eyes. 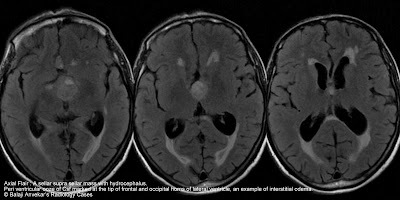 Trasependymal seepage is one factor in obstructive hydrocephalus. 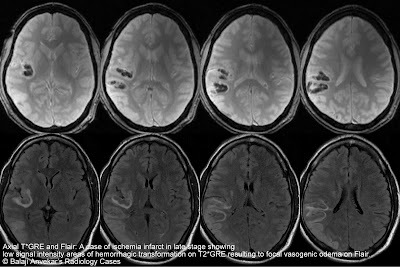 Another factor is normal csf produced in brain parenchyma slowly seeps into ventricles. This stops if pressure in ventricles increases and it accumulates within the periventricular white matter. Simply impressed by the concept it delivered. Well done. 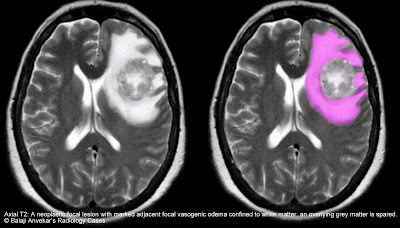 May I know why in vasogenic edema, the water only runs within the white matter but did not cross to the grey matter? I appreciate your inspiring and awesome presentations! I appreciate your awesome explanations and unique presentations!! !